There is a huge upset as Jay Cutler dethrones 8-time Mr. Olympia Ronnie Coleman!! A new Mr. Olympia is crowned and 8-time Mr. Olympia Ronnie Coleman gets 2nd place to the awesome Jay Cutler! Although Ronnie was in great shape the extra 10 pounds of hard muscle put on by Cutler tipped the balance in his favour, Cutler won all four rounds of the show for a historic victory. There is a huge upset as Jay Cutler dethrones 8-time Olympian Ronnie Coleman!! A new Mr. Olympia is crowned and 8-time Mr. Olympia Ronnie Coleman gets 2nd place to the awesome Jay Cutler! Although Ronnie was in great shape, the extra 10 pounds of hard muscle put on by Cutler tipped the balance in his favour, and Cutler won all four rounds of the show for a historic victory. 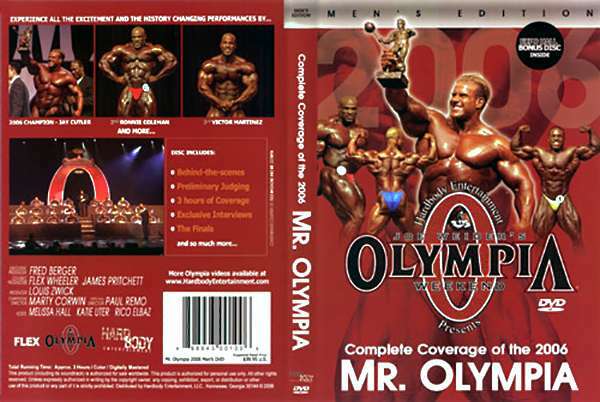 Complete coverage of the 2006 Mr Olympia. Expo Hall – Bonus Disc. Contains full Expo footage of the booths, athletes, swimsuit contest, bench press contest, and bouts of kick-boxing in the ring. In addition there are interviews with Pro-BB’s, fitness models, and MMA fighters. There is also footage of Joe and Ben Weider signing their new book, and loads of other great stuff. Interview with Jay Cutler after the event.